Sergeant James Williams, Company A, taken in Allegheny County Pa. either immediately before or after the war. For another Story of Sergeant Williams at Franklin, click and go to the last story. This letter and photographs graciously provided by Ms. Betty Adams of Cleveland, Ohio, a descendent of Sergeant James Williams, Company A, Sixteenth South Carolina. My thanks to all of you who provide and share all the wonderful items from our collective past. As the shadows lengthened and the day turned to twilight, the men of the Sixteenth looked back. No member did this with more poise or grace than Sergeant J.T. Williams of Company A. In a few sentences to an acquaintance in Washington in 1929; he summed up the afterglow of the hell that was Franklin. Like Berry Benson of McGowan's Brigade all that mattered in the end was the journey home... to once again hear the long roll with familiar faces and to sit down to a pipe and a story at the fire in the evening. The bright sparkling day, the beauty of an army poised at the top of Winstead Hill, on death's door, was what was remembered. The honor, the bravery, the camaraderie, and the love had in the end won out over the horror of war and defeat. One by one, they would pass over Jordan, no longer condemned by fate to proceed in masses... till only the silence of the written word remained. As has been said so many times in so many ways, man finally learns how to live, only when it is time to die. So many of these men learned that lesson so young and so well that they could not help but live well and die the same... no matter when death came. A final salute to the passing of the armies... the earth would not soon see the like of these men again... it had been a time to walk with the giants. James wrote me yesterday I was indebted to you for the striking likeness of Genl. S.R. 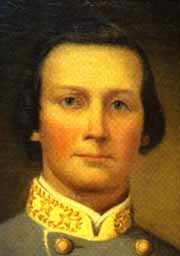 Gist, my Brigade Commander during the war between the States. It was indeed kind and thoughtful to think of me in connection with my brave and beloved General and I scarcely can think of words to thank you. I served under General Gist thorughout my four years of service and still retain a vivd recollection of the privations and hardships we shared together - the 30th of November will mark the last time I saw my General 65 years ago, when he lead his Carolinians and Georgians in the terrible charge against the four lines of breastworks at the battle of Franklin, Tennessee. Our Brigade then was in Cheatham's Division and rested in the charge on the left of the pike road leading to Franklin and Cleburne's Division on the right of the pike. I distinctly recall General Gist and his staff leading the brigade in the charge and a handsomer or more gallant figure of a soldier was not to be found in our army or that of our adversary. I do not remember at which point in the advance that our General fell, but think it must have been before we carried the first line of works. After that we forced the enemy from the second line and fought them across the third. On General Gist's staff was Lt. Trenholm and the morning after the battle I remember hearing the General's Last words were "Lt. Trenholm take me home to my wife." O! well, those of his command who have not yet joined him, will soon, and perhaps talk over our battles under him. At each annual reunion the Gray line is shorter and shorter. I was the last 1st Sergeant of my Company and have the roll of the Company. Of 160 men of the Company, but two can be accounted for living, one other and myself, and I am the younger - in my 85th year. Should I ever be in Washington again (and James says I shall) I shall make it a point to meet you, and perhaps tell you more of the Gist's Brigade you may not have heard.